1. 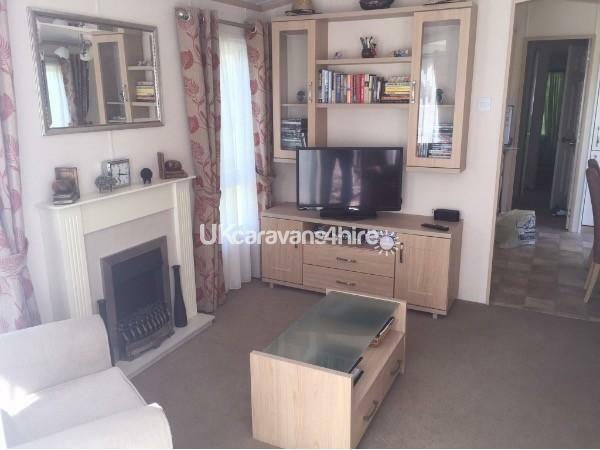 £50.00 deposit secures your booking. 2. balance paid four weeks prior to booking, with additional £100.00 refundable damage waiver. 3. payment by BACS or PayPal or cheque ( full amount). 4. leisure passes are extra. LAZY CHECK-OUT BY 1200 HOURS. A big welcome from me, Pemberton Abingdon! 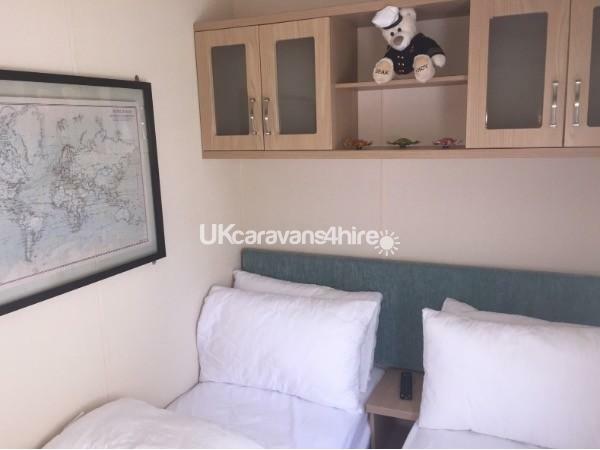 I am a 5-6 berth holiday home, refurbished by my owner to give me a modern make-over, with all the creature comforts to help you feel relaxed. I am equipped with a lounge, kitchen/diner, a deck, 2 bedrooms, a bathroom, BBQ, wooden picnic bench with parasol, private garden and parking. I am double glazed, have central heating, combi boiler, smoke and carbon monoxide detectors. My lounge has a 3 piece suite, fire place, Samsung 40" curved wide screen TV with blu-ray DVD player, a Bluetooth portable speaker, Nintendo Wii with 2 controllers and Wii games, selection of books, indoor games and mixed ages DVD's. I have been fitted with free guest 4G wifi. 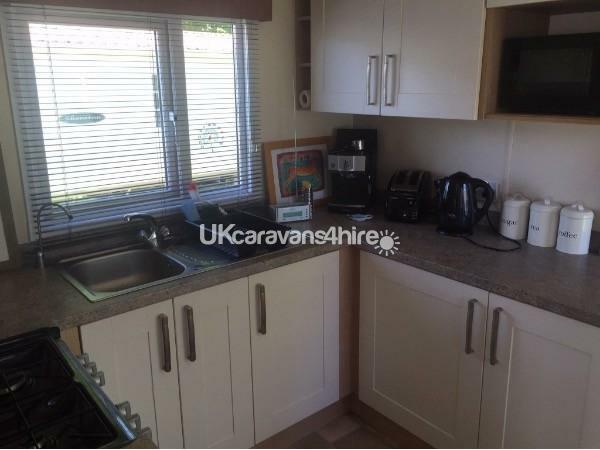 My kitchen comes with a gas cooker, sink, full size fridge freezer, kettle, toaster, microwave, proper ground coffee espresso machine, enough crockery, cutlery, kitchen utensils and glassware for 6 people, a dining table and 4 chairs and for my younger guests, I have a high chair and Mothercare travel cot with a spare mattress. My main bedroom has a double bed, walk-in wardrobe, powerful hairdryer, radio alarm clock, remote control TV/DVD and private door access to the bathroom. My second bedroom has a twin bed with remote control TV/DVD and a double wardrobe; my sofa in the lounge converts into a double sofa bed and there's still room for a dog. My family bathroom has a sink, mirrored cabinet, shaver point, extractor, loo and large shower. I also come equipped with an iron, ironing board, hidden safe, John Lewis anti-allergy duvets and pillows and mattress toppers. Outside, I have a front deck with a comfy outdoor suite and to the side there is a 4 seater picnic bench with parasol, BBQ and enough parking for 1-2 vehicles. 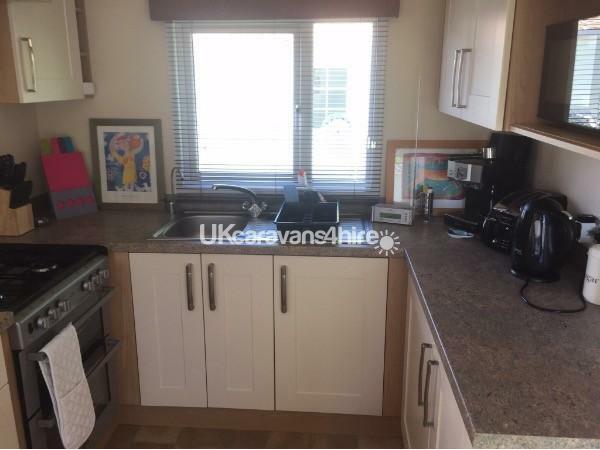 I am located in a quiet sunny area, 8 minutes walk to the main leisure complex or 6 minutes level walk to the inlet, with dog-friendly beach, beach cafe, water sports school, nature reserve with lake and walking trails, boatyard and fishing. If you wish to smoke, please do so outside and dispose of your butts in my terracotta ashtray. I am given a thorough clean after every booking and my lounge carpet is shampooed to remove any pet odour. Please look after me and leave me as you would wish to find me, both inside and out. I have been inspected by Rockley Park and am graded as "Platinum Retreat". A lot of my lovely guests decide to re-book early and also annually 2-3 separate weeks are donated to the F.O.Y.C.S. charity as auction prizes. F.O.Y.C.S. support, encourage and reward children, who no fault of their own, have become full-time carers to their handicapped parents, as well as having to go through school and growing up. Rockley Park has fantastic indoor and outdoor leisure facilities, an indoor pool with slide, a water chute tower, soft play zone, an entertainment auditorium with nightly shows, luxury spa, a well-stocked shop with off-licence and bakery, good selection of places to eat, a daily twice-hourly bus service into Poole and a well-planned hire shop for bed linen and other things you really should've brought with you, coupled with friendly, experienced, genuine staff and on-site 24 hour Security patrols, backed up with CCTV and vehicle number plate recognition. Please bring your own towels and bed linen (sheets, duvet cover and pillowcases). An additional £100.00 refundable damage waiver is also required. Leisure passes are not included in the price of the week. Additional Info: Outdoor swimming pool, all-weather pitch, climbing wall, water-sports, large auditorium with nightly entertainment, luxury spa and beauty treatments. Nature reserve, sailing school, beach, beach cafe, public bus service into Poole. 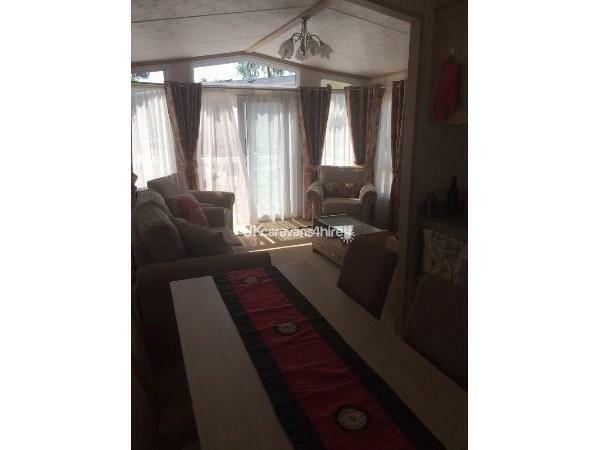 An excellent caravan with all the facilities you could want. Travel cot and high chair for my 1yr old-fantastic. TV in living room and both bedrooms added bonus. Plenty of dvds and wii games. 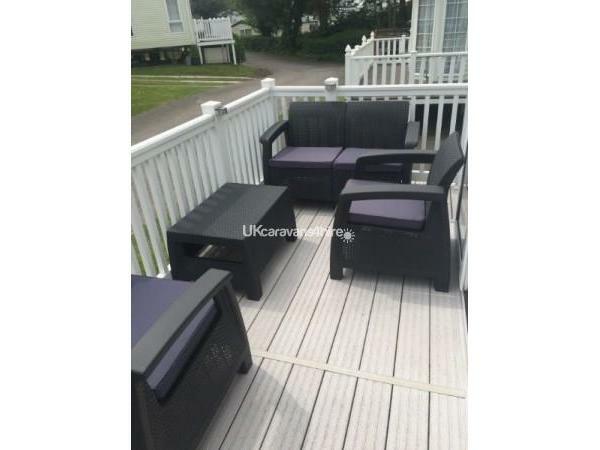 Lovely decking area with seating. Very very clean could not fault it in anyway! Only 5/6min walk to the beach area. Wish we were still there! I 100% recommend this caravan. We stayed for a week in May. It was just like home from home. We only had one rainy day but that was not a problem we spent the day watching the well stocked up to date dvd's and playing on the wii. There are also board games and plenty of books to read. 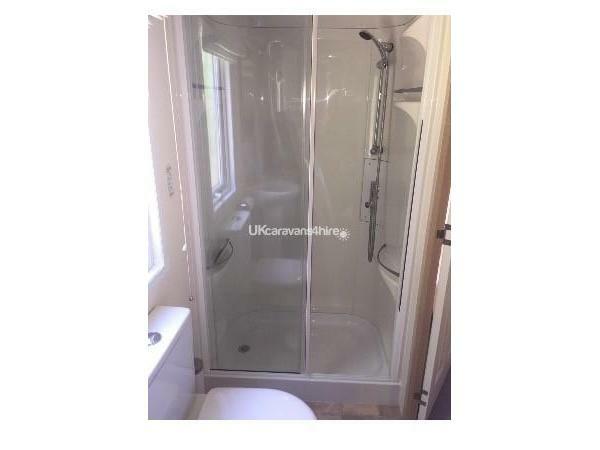 The owner has made the caravan so comfortable and the shower is excellent. We fell in love with the caravan as soon as we walked in. It is well stocked with everything you need. We shall definitely return. 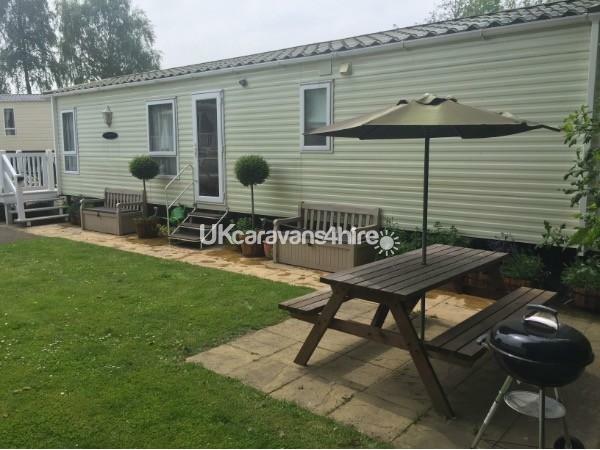 Three of us stayed in this caravan along with my little bichon dog.Nigel the owner was helpful from start to finish and the whole procedure was hassle free. 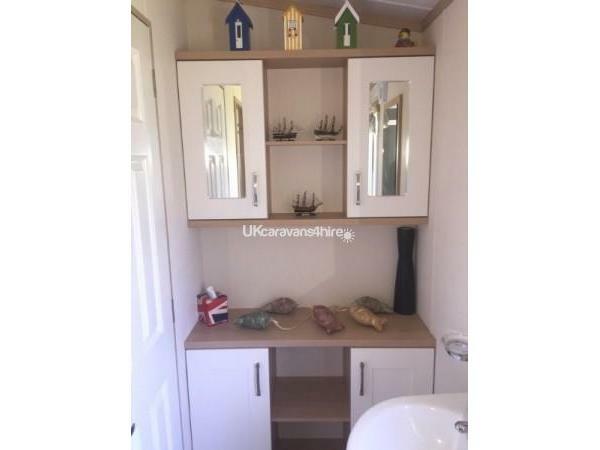 The caravan is the best we have ever stayed in,it's in a great location in the park.The caravan inside is equipped with everything you need whilst on holiday. The bedrooms both have the own tv and dvd players. And the master bedroom is very special in that it has it's own walk in wardrobe which my little bichon decided to use as her sleeping place at night.The bathroom is very large and the shower is powerful and great.The caravan is modern and decorated well throughout.We all thoroughly enjoyed our stay at Nigel's caravan and explored a lot of the surrounding areas and Bournemouth.I would 100% definitely come back here,hopefully soon. 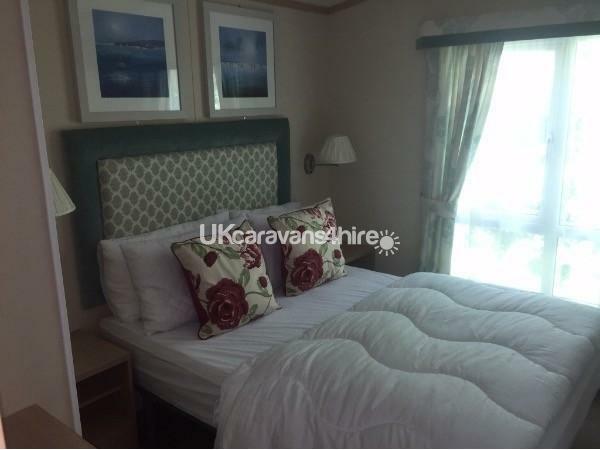 We had a wonderful time in this spotlessly clean caravan. 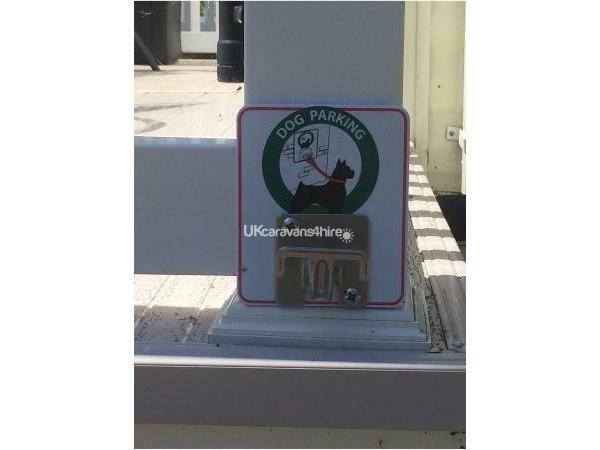 The location is ideal close to the beach for a spot of fishing/crabbing and lots of interesting walks for our dog. Great outdoor space for al fresco dining and BBQs or a glass of wine sitting out on the decking. 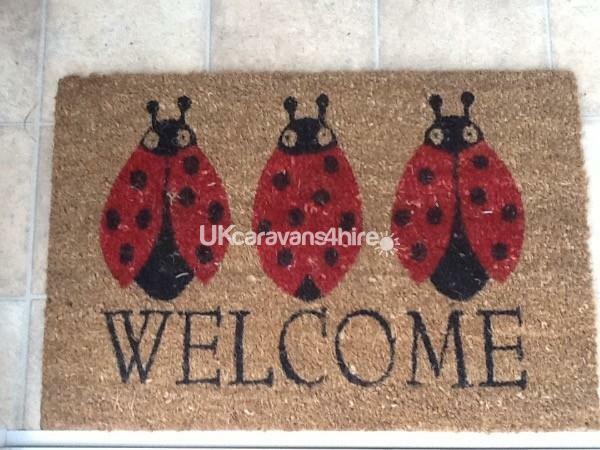 Inside the caravan has everything you need for a lovely stay, a real home from home with many little extras . Booking was straightforward and e-mails were prompt and helpful. We would love to come back sometime soon. loved the walk in wardrobe,bigger bathroom than the norm,nice touch with the lovely smelling molton brown reed diffuser.I love their products.Everything else great as expected.Rockley Park is a lovely site in a beautiful location 1st time we have been there and wont be the last.Alfie the dog loved it we always book a weeks holiday for him once a year.Spent time on the decking as it really is a sun trap.